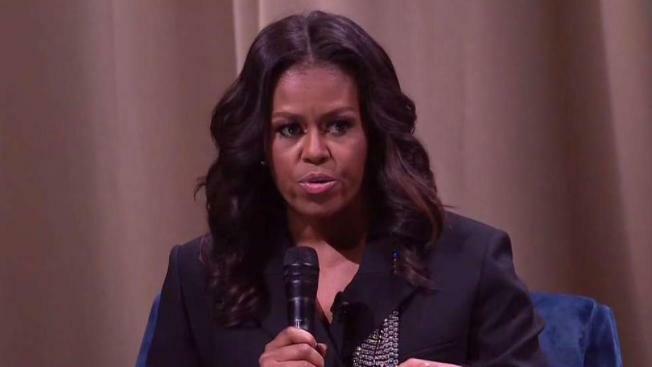 Thousands of people crowded Capital One Arena in D.C. Saturday night for Michelle Obama's "Becoming" book tour event — which included a special surprise for the former first lady. Lines outside the arena were reminiscent of the crowds the venue might see for major concerts and sporting events. Many people told News4 that braving the sold-out crowd was well worth it to see Obama speak. "Oh my gosh, just to be in her presence. And I love what she embodies - just the spirit of women, empowering women. It’s really exciting," Dionne Powell said. "I wish I could get a selfie with her, but I know that’s not gonna happen so just hearing her speak ... and getting a copy of the book and getting it signed," said Rita Barrett, who flew all the way from Atlanta. Obama's memoir chronicles her experiences growing up in Chicago, balancing the demands of being a working mother and her time serving as first lady. "We grew up in a neighborhood called South Shore on the South Side of Chicago. Yes! South Shore in the house," she said during the event. She touched on education, a topic close to her heart. "As we look at school inequality, and things aren't right, kids know when they are not being valued and it makes them feel some kind of way," Obama said. The conversation was moderated by her longtime friend and former Obama White House adviser Valerie Jarrett. The crowd leapt to its feet. Jarrett asked him what about Michelle Obama captured his heart when they met at a Chicago law firm where she was his mentor. Barack Obama said she was "one of a kind," strong and honest, and someone he knew he could always count on. "We thought it was really cool and that it was inspiring," one young girl said after the event. "She’s just so dynamic and just an amazing, amazing woman. I miss her. Any chance I get to see her, I’ll be happy to do that," said Susanne Wilborn. "Becoming" is expected to sell millions of copies and has the official backing of Oprah Winfrey.